From a chance encounter on the website Ethnologue.com, which we’ve referred to before because of their unique definition of Basque as a “Spanish language also spoken in France”, we’ve come across another language, a mixed language (a language characterized by combining syntactic, phonetic, and morphological features of a language with those of another, without a stable grammar) made up as a mix of Romani and Basque, called, among many other names, Erromintxela. Again, this website makes the same mistake, though in the other direction, calling this a French language when it really belongs to the Basque Country. We found the idea of Erromintxela, which today is only spoken by about 1,000 people throughout the Basque Country, on both sides of the Pyrenees, curious, so we dug a little deeper to find out more about them and the roots certain groups of Gypsies have put down in the Basque Country over the past five centuries; enough time, we think, to make them both Basque and Gypsies. It’s also been enough time for us to remember the persecution and blind hate societies have maintained and unfortunately still maintain to any minority group that for whatever reason falls outside the lines. Este (Echauz) acted as a friendly mediary between the parties, and after much arguing and haggling, they usually reached an agreement. Generally, the Vice-count spoke to Ustáriz with these or similar words: “¿Cerdioc hic Uztariz? Ordituc” (What do you say, Ustáriz? There you have it). The reply, without a hint of blushing, as in the case of Juan de Adalor from Garzáin: “Vay eguiada amendira,” (Yes, it’s true, there they are). Other times, he would reply, “Eguiada orrelaco gauza baxuec guc ecarri guinducen” (It’s true, some things like those we brought). The Erromintxela arrived in the Basque Country in the 15th century speaking Kalderash Romani. 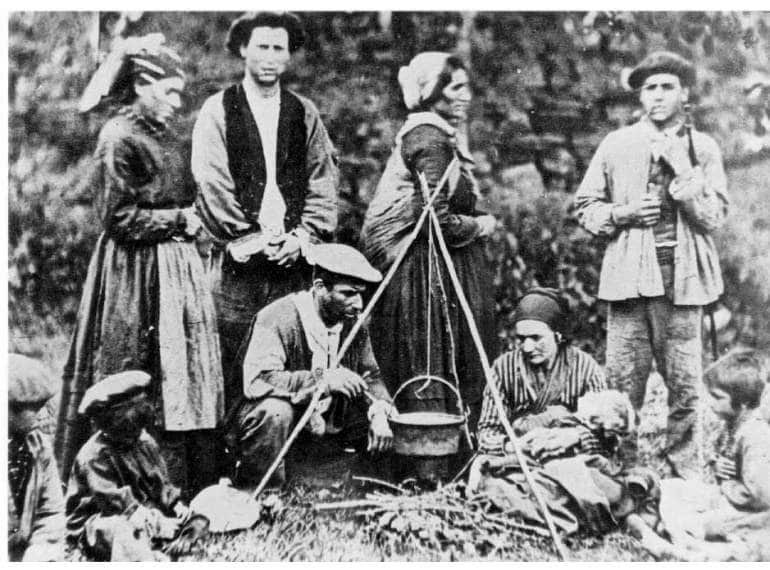 They integrated much more deeply into Basque society than other Romani groups. In the process, they acquired the Basque language and adopted aspects of Basque culture such as increased rights of women and important traditions such as bertsolaritza (extemporaneous poetic song) and pelota (the national Basque ballgame). We can also find information on how this language has come to be dying out, with just 1,000 speakers spread out, as we said earlier, on both sides of the Pyrenees. Unfortunately, the Spanish Wikipedia’s article on Erromintxela is much shorter, and offers a great deal less information. Interesting. We’ll leave you with the original reference to this language that we found on Ethnologue.com; the article from the Auñamendi Encyclopedia; the wonderful English Wikipedia article; and a song in this language. The video of this song, as well as an explanation of the importance of George Henry Borrow in the study of this language is provided by the always amazing Iñaki Beraztegi. Orígenes. Poco se sabe sobre los orígenes de este pueblo, en parte aún no asentado de forma estable y dotado de características diferenciadas propias, al que se supone llegado de la India apareciendo en Europa a comienzos del siglo XV. El hecho de que casi todas las lenguas europeas registren una voz derivada del vocablo egipto para designar a los miembros de este pueblo sirvió de sustentáculo a la teoría que los hacía proceder de tal país africano, aunque la existencia de variantes tales como húngaro, zíngaro o bohemio denoten otra posible adscripción geográfica, por otra parte difícil, como todas, de demostrar. El euskara registra la voz ijito pero también buhame, predominando la primera en la zona meridional y la otra en el N. de los Pirineos. Los primeros asentamientos de estos nómadas tienen lugar en las zonas fronterizas de los reinos que compondrán las monarquías francesa y española: Aragón, Castilla o Aquitania. Erromintxela (Basque pronunciation: [eromintʃela] is the distinctive language of a group of Roma living in the Basque Country, who also go by the name Erromintxela. It is sometimes called Basque Caló or Errumantxela  in English language; caló vasco, romaní vasco, or errominchela in Spanish language; and euskado-rromani or euskado-romani in French. Although detailed accounts of the language date to the end of the 19th century, linguistic research only began in the 1990s.